In the opening shot of Crazy Ex-Girlfriend, it's clear Rebecca Bunch is one of us, in fact she's singing her heart out in the ensemble of a summer camp performance of South Pacific. Nine episodes, a giant pretzel and countless original musical numbers (some with Santino Fontana) later, the CW series has become an award-winning, critically acclaimed musical comedy. How often does that happen? Co-creator Rachel Bloom won a Golden Globe in January for her leading performance as Rebecca, and her enthusiasm for all things Broadway is palpable. While she comes from a sketch comedy background, the performer also studied musical theater at New York University. We recently asked Bloom about her show tunes of choice, Broadway crushes and more. Check out her answers below, and catch the CW's Crazy Ex-Girlfriend Mondays at 8PM! The first Broadway-ish show I ever saw was the tour of Beauty and the Beast when it came to LA. But the first actual Broadway show I ever saw was The Lion King, and in the same trip, I saw Annie Get Your Gun with Bernadette Peters. I think I was three years old and I did a children's community theater play of The Three Little Pigs. Yeah, it was great. As a straight woman, my musical theater crush is Marc Kudisch. 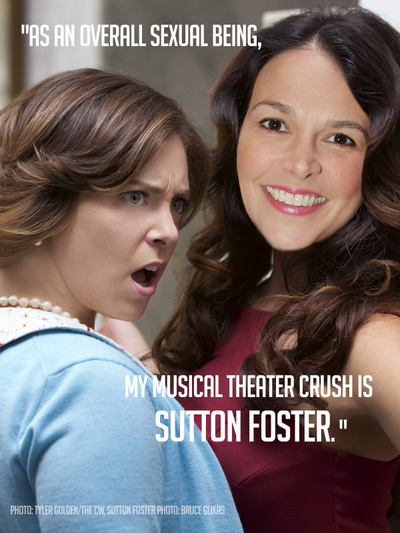 As an overall sexual being, my musical theater crush is Sutton Foster. The original My Fair Lady just because that sounds like a ball. That sounds really fun. A close second is Ethel Merman in Gypsy. 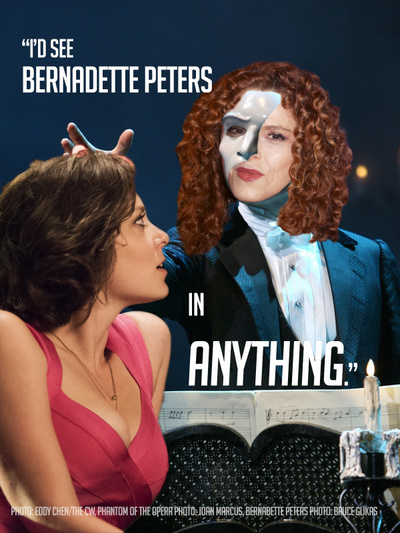 I'd see Bernadette Peters in anything. When I was really auditioning for musical theater a lot, there was a lack of good hard comedy songs for women. There was this song I found called "Darryl is a Boy (And He Lives in My Closet)" by this composer Michael Mitnick. That was my go-to for a while. Probably now it would be one of my own songs—if that's not the worst thing to say. I actually have written a full-length musical. It’s basically a f**ked up 42 Street. I really like doing "Ya Got Trouble" from The Music Man as a karaoke tune because it makes everyone really uncomfortable and it's weird. Dot in Sunday in the Park with George. My gender-swapped dream role is Harold Hill in The Music Man. Ideally something I've written. And if not, Funny Girl. Actually, that's my dream role. Dot in Sunday in the Park or Fanny in Funny Girl.